When Portland architect Andrew Montgomery of Terraforma, a Portland-based architectural firm, first saw the highly dilapidated home that Oliver Properties had commissioned his firm to remodel, he saw beyond the leaking single-pane aluminum windows and rotted walls. He could tell this was the work of a skilled architect. “I knew it was something special. Through the years of neglect, overgrown brush and odd alterations, I recognized the bones of a building designed in the classic midcentury modern style,” says Montgomery. So while the contractor, Rothchild Construction, began removing the rot, bad sewer lines and truckloads of old carpet, roofing and overgrowth, Montgomery did some research to find the home’s original architect. 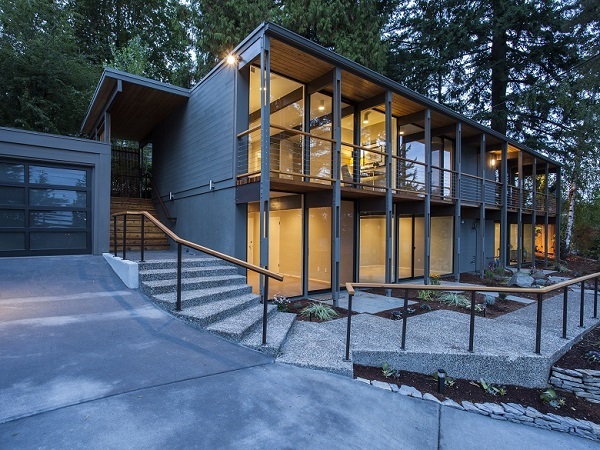 “There were no plans available at the City of Portland’s building department, and there was little help from local modernist experts. But by chance one day, while I was on the job, a carpenter overheard his conversation with the owners and shared that his father had worked on the homes original construction, he recalled that the home was designed by a well known Portland architect,” says Montgomery. Later it was confirmed through a previous owner that the architect’s name was Frank Shell. Shell was primarily a commercial architect with the firm Farnham, Shell & Hoyt during the ‘50s and ‘60s. 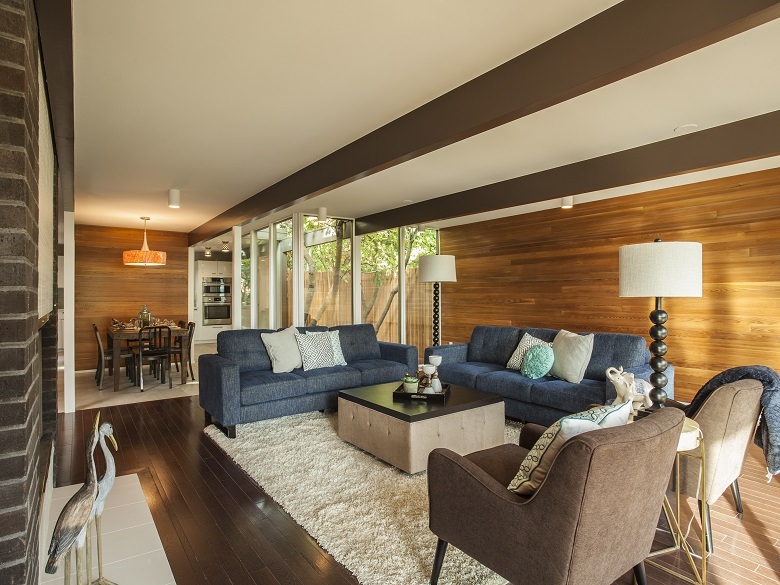 He had designed several residences and was well known at the time for his cutting-edge style, which now defines the iconic midcentury modern look. “At first glance, one might actually think it was an office building. The floor-to-ceiling glass on both floors and an elevated front walkway, just wide enough to clean the glass, were very similar to buildings done during the same period. 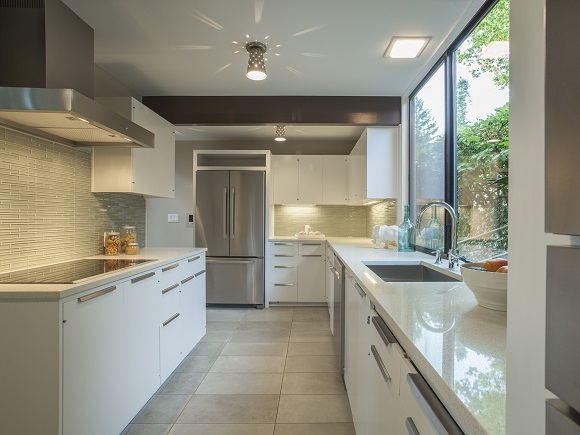 Clean lines and other features —such as a whole-house intercom system, light fixtures and a stark white palette— expressed the ideals of the modernist movement. The painted plywood kitchen cabinets had brushed-aluminum handles that were ahead of their time and expressed Shell’s streamlined style,” says Montgomery. Interior designer and Terraforma co-owner Dana Montgomery was excited to find period fixtures to replace those that had disappeared over the decades. Some of the bedrooms were too small for today’s standards, so Terraforma redesigned them to fit the exposed beam and window grid. 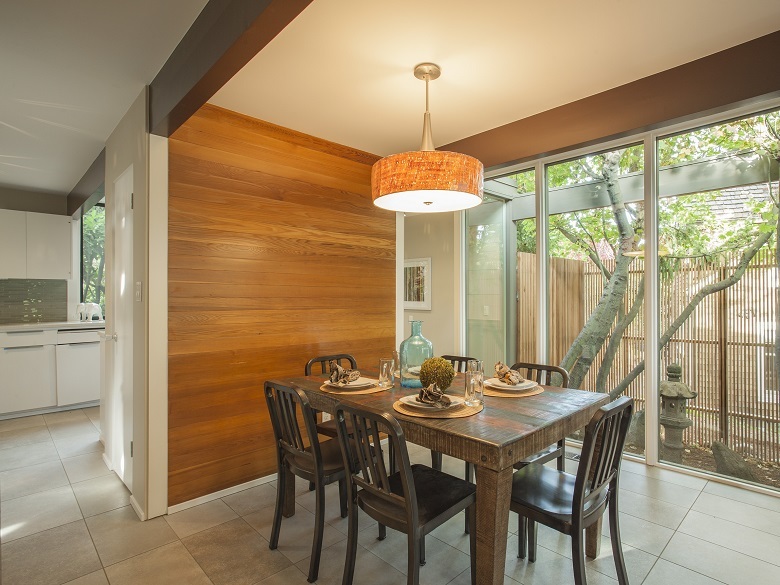 Contractor Loyal Roth took great care to re-create handmade window frames and wood screens to match Shell’s original design intent. Roth also restored the original custom cabinetry and modified it to meet the needs of today’s homeowner. The “space age” intercom system was brought back to life, and the floor-toceiling, single-pane-glass was replaced with double-pane insulated units. Insulation was added to the roof and the mop-down tar was replaced by a single-ply membrane. Garage doors were replaced with a glass door system, and the lot was completely relandscaped, including new stone walls and railings. To the owners delight, the remodeled home sold quickly for much more than what the owners expected. “It is rare that you get the opportunity to restore a price of regionally significant period architecture that has not been destroyed by previous remodels. We were fortunate to have a the developer and contractor embrace the restoration idea, and go above and beyond the call. I think Frank would be very proud of the results,” says Montgomery. 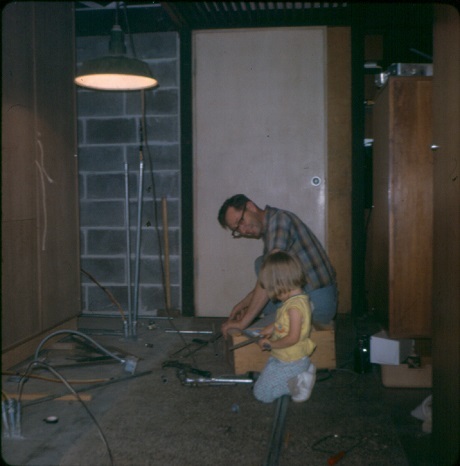 The beginning stages of Shell's original home, which he designed and built himself; Shell with his daughter, Nickie, who says of the home she grew up in, "My dad built a lot of the house himself. He was a very hands-on kind of person and loved building things." 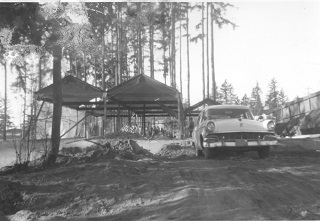 Frank Shell was a modernist architect active in Oregon between 1950 and 1980. 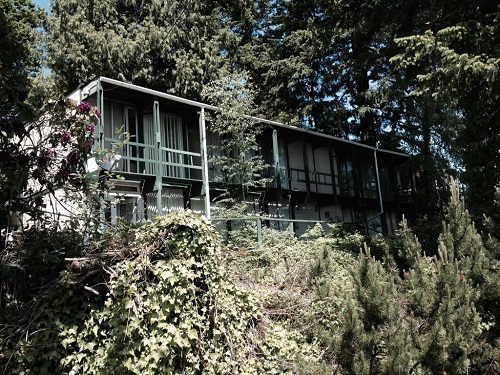 He was a pioneer of the modern style in Portland and although he specialized in schools and churches he also designed many homes, especially around Reed College, for which he designed the Cross Canyon Residence dorm. Shell passed away in late 2006, at the age of 86. 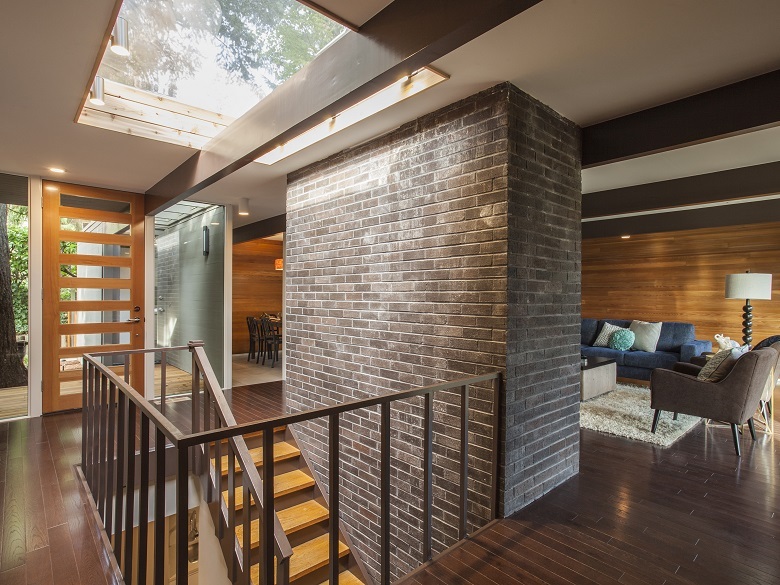 A home designed by Frank Shell, which was featured in the 2016 Modern Homes Tour. Homeowner Cole Gerst says of his Frank Shell home, "We wanted to keep the original footprint and chose not to change the structure of Frank's original design. 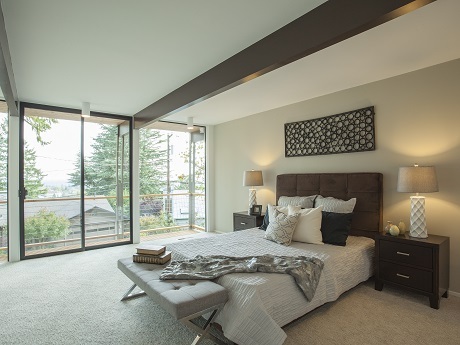 We love all the floor-to-ceiling windows and original solid fir doors."